Visy is one of Australasia’s leading manufacturers of corrugated cardboard boxes and packaging. The Visy name is synonymous with quality packaging in Australia. The Visy name is synonymous with quality packaging in Australia, foremost for our experience and expertise in the area of various types of cardboard packaging. At the company’s inception in 1948, corrugated cardboard boxes were our primary offering. Since then, our commitment to innovation and excellence and a specialised sales team who go above and beyond, places us at the cutting edge of our industry. We have a stellar reputation and the capacity to create solutions for our customers, no matter what the challenge, across a wide array of packaging types. Over 70 years of experience in the business positions us as the market leader in Australia and New Zealand and the largest manufacturer of corrugated packaging. Our ongoing commitment to investment in our factories means that our facilities are amongst the most sophisticated in the world. Our expertise affords us the ability to tailor solutions across multiple channels, including major retailers, export, wholesale and specialist areas such as cold chain, heavy duty and dangerous goods. 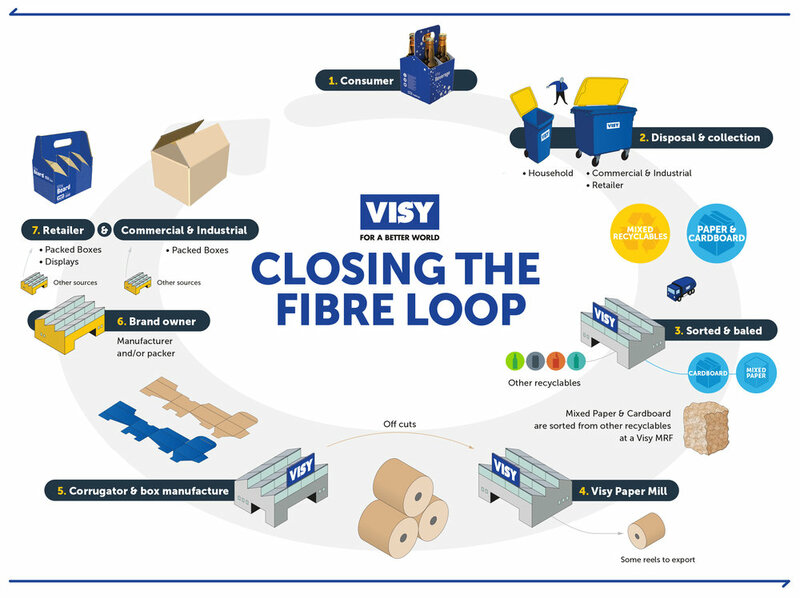 Visy’s integrated supply chain (production of kraft and recycled papers for local and export markets) provides us with greater control of the raw materials used for our products; many of our competitors rely on third-party suppliers for their kraft paper. This puts us at a distinct advantage, particularly regarding our ability to facilitate speed-to-market and cost-effectiveness. In spite of Visy’s ‘big business’ reputation, we are also sensitive to the needs of small to medium operators, with the capacity to service and supply these types of businesses. Our dedicated sales representatives ensure that we offer our personalised approach to each and all of our customers. Additionally, our alignment to a variety of supporting service divisions means that we are your one-stop solution for packaging. Visy’s ISO and HACCP quality certification and ongoing commitment to product and service excellence contribute to our unique position to best service your business, no matter what your industry and requirements. In addition to our customised solutions, two businesses in the Visy family, Visy Boxes & More and Boxes Direct, provide an array of ‘off-the-shelf’ stock offerings. These simple-to-order, in-stock designs afford our customers competitively priced and streamlined alternatives which uphold our dedication to service and product excellence. Do you need boxes now? Our off-the-shelf designs are simple to order and always in stock. Servicing businesses for over 40 years (formerly as Homewrap), Visy Boxes & More offer a comprehensive range of corrugated cardboard products and boxes. Our one-stop consumables shop provides everything that goes in, on and around boxes too, from packaging tape and bubble wrap, to strapping, stretch wrap and poly bags. Boxes & More has its origins in the removals industry and currently serves the needs of the moving and storage industries, in addition to creating packaging solutions for retailers and online sellers. Furthermore, our access to Visy’s nationwide logistics footprint results in express delivery times for our customers. Based entirely online, Boxes Direct are committed to providing the best product and most streamlined, simple service before your move. Whether you’re moving your home or business, let us create a fast, convenient solution for you. Visy support and partner with a select range of industry bodies across an array of market segments to meet our strategic objectives. We see enormous value in supporting and strengthening the industries that support us, and as such, are committed to long-term associations of this nature.